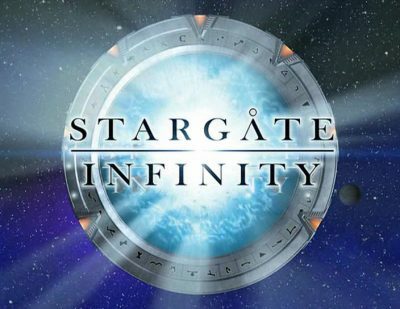 Well here we are again once more taking a look at Stargate Infinity and it’s premiere episode Decision. This time around Alan and Shayne sat down earlier this year to record a commentary intended for a april fools joke but it was better used for a christmas bonus show so sit back and enjoy. In Stargate Infinity “Decision” we are introduced to the world which is set around 30 years after the SGC was created and became operational. The characters are totally new and the SGC seems to have expanded significantly as more vehicles are used thus the gateroom and ramp are designed for such a purpose. The story begins with the court martial of Major Gus Bonner who supposedly disobeyed orders which led to his team being killed by an alien threat. An age old sarcophagus is discovered believed to house the remains of an ancient (which turns out to be still alive) and once again Bonner is seen to be allowing the aliens to invade the SGC. The young SG team still under training battle the invading aliens and when cut off they escape through the gate and find themselves far from home, Bonner now in their eyes exonerated leads them onwards on the journey to find their way home and to solve the puzzle of the ancient creature. Stargate Infinity lasted just a season (26 episodes) but did get a DVD release. While the voice talent for the show is impressive the show can not be considered canon and overall suffers due to poor animation and the simple fact they chose not to make the most of the existing TV series as basis for their stories. As we’ve seen with Star Wars if you allocate a reasonable budget and use the establish source material to the max you can create an entertaining show for new and existing fans, Infinity failed to do either. Next week we are going to be taking a look at Poltergeist The Legacy S1E18 “Inheritance” which features Stargate cast and crew in front and behind the camera, Thomas joined Mike for that show so tune in and let us know what you think. We still have the Atlantis retrospective, Travelers premiere and Stargate (movie) to look at before we return to Stargate Universe so if you have time on your hands over the holidays we’re here to help you fill it. Oh also worth noting that Travelers will be appearing on Netflix from December the 23rd.